Squash boat recipes were unknown to me, until recently. What a discovery! They are perfect for a light lunch and are, of course, incredibly tasty. 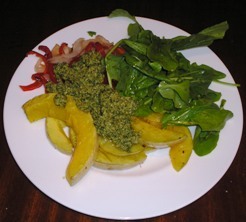 This dish will take around 55 minutes for you to make and will serve 4 persons. 1. You start by turning on the oven and putting it on 200˚C. Now, cut the butternut squash in halves and then in slices of 2 cm thick. Put them all in a baking tray and pour 2 tablespoons of olive oil over them. Followed by 1 tablespoon of dried crushed chillies and some salt and pepper. Let it bake for 15 minutes. 2. Take the tray out of the oven and turn the squash. Now put the onions and peppers on the squash. Let it bake further for another 25 minutes. The aim is that the vegetables are getting tender. 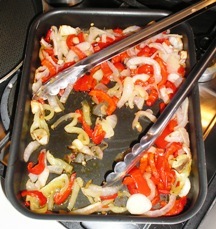 You can also put the onions and peppers in a different tray and then the baking time is reduced to 15 minutes. 3. 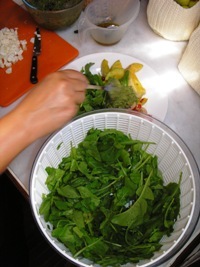 Next, you put all the rocket salad leaves in a bowl, together with the rest of the olive oil, the lemon juice and some pepper. Mix it around! 4. Put the salad on 4 plates and divide the squash, onions and peppers on the salad. Pour some pesto over it and some mozzarella, by tearing the ball of Mozzarella apart.